Well spring is here, at least in California where it’s rainy one minute and sunshine the next, so I’m looking forward to some of the fruits and veggies that will be available very soon. Hopefully your winter is winding down as well and fruitful times are ahead for you too. This month in Vibrant Living I have several articles for you, one on making the 80% raw diet work, and the other on healing the energy body. And as usual Gretchen has come up with another great recipe. Enjoy! A common statement made by people when exposed to the raw food diet is “I could never eat like that”. I’m sure you’ve probably heard that from your friends, family and co-workers as well. And that sounds exactly like my answer to my college friend nearly 40 years ago when he was sharing the benefits of an all vegan diet with me. I thought, I could never eat like that and now I’m nearly 20 years on a vegan diet. 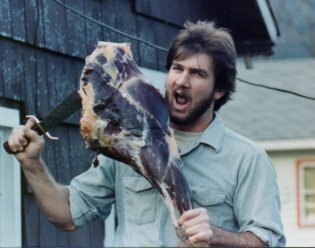 The crazy thing is that in the years following college I moved to a rural area in the Pacific Northwest and was a huge meat and fish eater, although much of it was wild game which is much healthier than farmed animal flesh. But I came to a point where I wanted to take my health to the next level and giving up meat was actually quite easy for me. Over the years I did take a lot of guff from friends and co-workers in logging and heavy construction, but my performance and great health always quieted the loudest hecklers. Over time many of those same people came to me for diet and heath related advice because they could see the truth before them in my results. A lesson I learned in my early 30’s was to “never say never”. For years I had bashed people who lived in mobile homes and said I would never live in a mobile home. Years ago I walked away from a house I had bought with my girlfriend after the relationship went south and I found myself starting over. The only thing I could afford at the time was…yep, that’s right, a mobile home. It turned out to be a great investment and suited me fine as I worked away from home much of the time anyway. When I did move again I was able to make a nice profit on the mobile home and along with money I had saved I bought a great little farm house on 9 acres. The point is that I never thought in my wildest dreams I would be a vegan or live in a mobile home, but I did both and they actually turned out very well for me. So I always encourage people to be open to life’s experiences and possibilities even when their initial feeling is that of resistance. 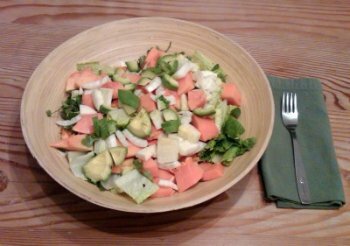 Those of you familiar with my writings, or is it ramblings…lol…well whichever it is you know I firmly believe that excellent health can be enjoyed by consuming a 75% to 80% raw foods diet. When we take the pressure of the 100% raw food diet away I think many more people can see themselves at least attempting if not being successful on a raw food diet. What do you think? Of course if health is to be gained from such a diet, the diet must be comprised of mainly healthy foods, both cooked and raw. Loads of raw fat laden deserts and savory recipes, raw chocolate, and cooked junky foods do not provide the building blocks for good health. The good choices we make today provide the building blocks for our great health tomorrow. I feel a 75% to 80% raw diet is doable for most people and will provide amazing results for them. If I was to layout some thoughts or rough guidelines for a 75%-80% raw diet I would recommend eating cooked food at only one meal per day. This includes snacks. I feel that starting out the day with raw building blocks is very important for good health; it’s easier on the system and sets the tone for the day. I have found that a large green smoothie in the morning provides a well balanced meal that can carry a person for hours. Comprised of Fruit, greens, and a little fat it provides a good nutrient dense meal that satisfies the palate as well as the body’s caloric needs. Lunch might be a few pieces of fruit with greens, some fresh sprouts, and perhaps a little fat of some sort. This could be eaten separately or mixed and taken as a salad or even another smoothie if you chose . If your body constitution and metabolism is such that you require less fruit and more fat then you can substitute the fruit for some denser vegetables, like cabbage, broccoli or cauliflower and add slightly more fat. I feel everyone could benefit immensely from consuming 16 to 32 oz. of fresh green juice a day, and later in the afternoon about an hour before dinner would be a great time to enjoy your juice. You could juice your own or drop by a grocer or health shop and order a freshly juiced drink. Like all food, this should be taken on an empty stomach or it’s simply a waste of money and counterproductive health wise. The evening meal could be a large salad with a fresh squeezed fruit juice and nut or avocado dressing, topped with steamed veggies and perhaps a small side of quinoa, brown rice, or sweet potato. The key to dinner though is not over eating. The work day is done and we really just need enough calories to rebuild our energy stores and get us through until the morning meal. Over eating at night is a prime cause of weight gain and disease. These are just ideas of what the 75%-80% raw daily menu could look like. It’s whatever works for each individual, and a person certainly doesn’t have to start out at the 75% raw mark. They can start where they are and increase the amount of raw foods until they hit their desired goal. Adding in any amount of raw foods is going to be beneficial so whatever happens will be a good thing. One of the reason the raw food diet produces such good results is because when you eat raw foods you have less room for less healthful foods. It’s as simple as that. So the next time someone tells you they could never eat a raw food diet you might remind them to “never say never” and direct them to the website so they can learn about turning their life around with raw foods. Great ideas for starting a raw food diet. A strongly as I feel that raw foods will create incredible health I also believe that there are other considerations to contemplate when putting together a plan for optimal health. 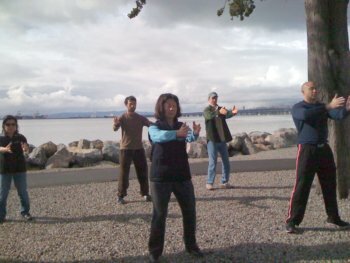 The Chinese Taoists believe there are three components to good health. They are Jing, or the physical body, Chi or the energy body, and Shen, the spiritual body. All three must be balanced and healthy to provide good overall health. To the Taoists it’s the Chi that connects the Jing and Shen together. Their healing methodology is to treat the physical body (as with herbs) and the energy body (perhaps acupuncture) and the spiritual body with prayer and or offerings. In the west we treat something like cancer on the physical level only and never treat the system as a whole which is why more often than not it returns. With a raw food diet we’re already healing the physical body, but how do we go about healing the energy body? First I’ll say that I feel raw foods go a long way in cleaning out the system so energy can flow and one can be more in touch with the earth and spirit, however there’s usually more to be done. There are many ways we can balance or stimulate the energy body, many of which you’ve probably been doing for years or at least tried. Things like massage, acupuncture, qi gong, tai chi, yoga, and meditation all open channels and stimulate or balance chi, even walking barefoot in nature balances and regenerates as we connect with mother earth and her healing energies. I have been sleeping on a magnetic mattress since 1994, and just recently have started sleeping grounded, both of which I feel are very beneficial to balancing the energy body. My preferred spiritual healing practice is known as Kunlun in the west and “spontaneous healing” in China. It has unlimited potential in the healing and regeneration it can offer. I’ve done other things over the years that people have laughed at and quite frankly have given me a good chuckle or two also. When I first started grounding, Gretchen was a little skeptical, but now she’s a proponent of grounding and its positive effects. It’s not important how you do it, just that you do it in some fashion. We in the west tend to not focus on the whole, but instead compartmentalize issues. If we’re ever to be truly healthy and happy we must treat the body as a whole and that means stepping out and learning or exposing ourselves to something new. Of course if the energy body is way out of balance the help of a natural health practitioner with knowledge of the energy body may be required. So whatever method excites you and works for you is the best method. Experiment and take a class that deals with opening up and healing the energy body, or try a new product, or get out in nature barefoot daily and see what changes you experience. I think you’ll be amazed at the positive changes in all facets of your life as you open up to balance and heal the energy channels of your body, mind and spirit. Quantum physicists discovered that physical atoms are made up of vortices of energy that are constantly spinning and vibrating; each atom is like a wobbly spinning top that radiates energy. Because each atom has its own specific energy signature (wobble), assemblies of atoms (molecules) collectively radiate their own identifying energy patterns. So every material structure in the universe, including you and me, radiates a unique energy signature.